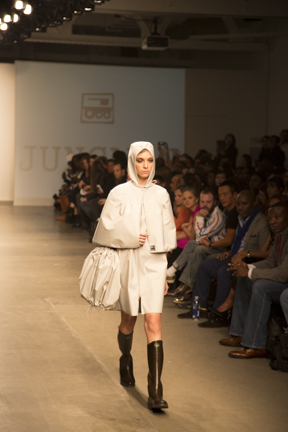 The Jungwon collection featured sleek raincoats and pieces - I even spotted some cool weatherproof bags. My friend Jena even got to walk the runway! The Samantha Cole London collection was very rock and roll with big hair and loud pieces. Following the Samantha Cole London, was the Lilly Lorraine collection which was much more subdued. There was a lot of interesting knitwear looks as well as some bold red looks. The Dany Tabet show consisted of gowns with a lot of decorative beading and shapes. The designer even proposed to his girlfriend on the runway after his finale walk! You can view more photos on my Facebook page. Special thanks to my friend, Jonathan Rios, for these amazing photos! Congrats to your friend for walking!